I’m a bit of a history nut, so I love to visit castles and palaces when I travel. And Drachenburg Castle is a dramatic-looking bit of architecture to add to your sight-seeing list when you’re in Bonn! Located a little outside the city proper, you’ll find this late 19th-century palace, high on a hill overlooking the Rhine and all of Bonn. Inside, you’ll find paintings and other luxurious, period-appropriate furnishings; outside, you’ll find immaculate terraces and gardens. Admission is a fair €7 per adult, so it makes for an easy and inexpensive day out—and the views from the North Tower are jaw-dropping! Drachenburg Castle in Bonn, Germany © Shutterstock, Inc.
2. Beethoven Haus and Beethovenhalle. Beethoven was born in Bonn, and today, Bonngasse 20 has been turned into a museum about the life of the famous composer. You can expect to see plenty of information presented, both about his time spent in Bonn as well as his time spent in Vienna—and because the place is still a major research center for Beethoven-enthusiasts, there is a rotating collection of special exhibits that comes in from all around the world. When you’ve learned all there is to learn about the man, head to the Beethovenhalle for a concert by the Beethoven Orchestra and prepare to be absolutely reeling with sensory delight. Of any orchestra in the world, this orchestra presents some of the best renditions of their namesake’s pieces, so you’d definitely be amiss if you didn’t add a concert (or two!) to your list. Beethoven House (Beethoven-Haus) in Bonn, Germany © Robin Nieuwenkamp | Shutterstock, Inc.
Beethoven Monument in front of the old Post of Bonn, Germany © Steffiheufelder | Shutterstock, Inc. 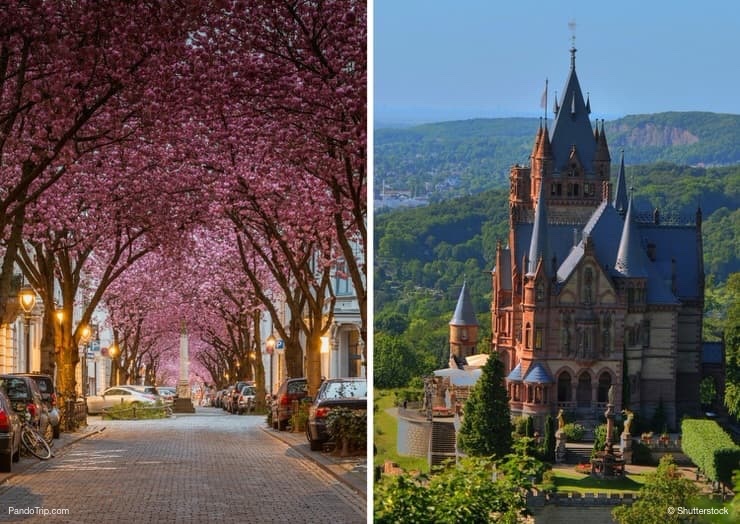 When you think of cherry blossom festivals, you’re probably thinking of Japan—but think again, because Bonn has it’s own cherry blossom festival every spring, typically sometime in April, and it’s extraordinary to behold. The splashes of pink on Heerstrasse Avenue are a beautiful mark of color against the streets pale, Neoclassical buildings, almost as though some painter created the image. And because the streets are so narrow in places, the trees, which were just planted in the ’80s, form a kind of pink tunnel over the roads, with just a little bit of sky peeking through if you look at the right angle. The flowers are typically in bloom for a couple weeks—but don’t delay your trip: you’ll want to come back day after day to soak in the atmosphere and beauty at one of the many outdoor cafés! Plus, there are typically live music performances, art displays, and more for the duration of the festival. Cherry Blossom Avenue, Bonn, Germany © Shutterstock, Inc.
Cherry Blossom Avenue, Bonn, Germany © Prashant Agrawal | Shutterstock, Inc.
Cherry Blossom Avenue, Bonn, Germany © Christian Mueller | Shutterstock, Inc. Believe me when I say Bonn is full of cultural activities. And nowhere is this more evident than along the mile-long stretch named the Museum Mile. If you’re interested in World War II and modern history, the Haus der Geschichte (or House of History) is for you. Or if you’re into natural science, the Alexander König Museum may be the place for you—it’s one of the best natural history and zoological museums in all of Germany, if not the world! There’s also the Deutsches Museum Bonn (which histories technological advances), Kunstmuseum Bonn (the art museum), the Arithmeum (which gives the history of mathematics), the Rheinisches Landesmuseum Bonn (another history museum, and one of the oldest in Germany)… Well, the list goes on and on! One thing’s for sure: a rainy day in Bonn will never leave you with nothing to do. View from the museum of art © Christian Mueller | Shutterstock, Inc.
Art Museum in Bonn, Germany © Shutterstock, Inc.
Front of the Museum Koenig in Bonn, Germany © Shutterstock, Inc. This Baroque palace is one of the most impressive buildings in Bonn. It stands on the site of a ruined castle and was constructed in the 18th century. The building has belonged to the University of Bonn since the early 19th century, and it houses the university’s fascinating natural sciences collection. Near the palace, you’ll also find the Botanical Garden of Bonn, which is home to literally thousands of types of flora. You could spend a whole day wandering the palace and the garden, so leave yourself plenty of time! 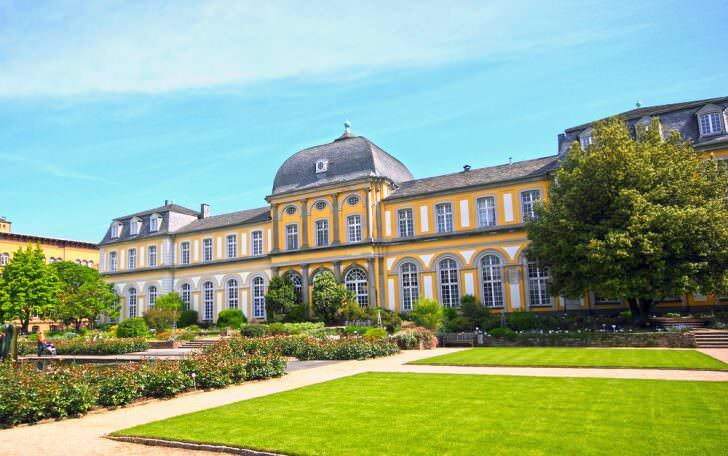 Poppelsdorf Palace in Bonn, Germany © Shutterstock, Inc.
A cruise on the River Rhine is both scenic and romantic, but it’s far from the only way to enjoy the Rhine—and personally, I like to get out of the city to see the river at its full, natural best. The Ahr is an offshoot tributary of the Rhine, where the water drifts lazily through picturesque German countryside. The best time of year to visit, in my opinion, is during the summer, when you’ll be able to sample the region’s fine wines at a number of different wine festivals. But any time from spring to fall, when the weather is temperate, is lovely for hiking, biking, or just relaxing on the riverbank with a picnic. Ahr Valley, Germany © Shutterstock, Inc.
7. The Marktplatz (Market Square). Bonn’s central market square is one of the oldest, most important parts of the city, and nowhere is that more evident than in the architecture. The old rathaus, or city hall, can be found here, as well as a number of other pretty Rococo-style buildings. And if you’re a shopper, this is the area of the city—just have a wander around nearby streets like Acherstrasse and you should have no trouble finding anything you might need. Of course, you might never get around to shopping if you, like me, are too busy gawking at all the great architecture! 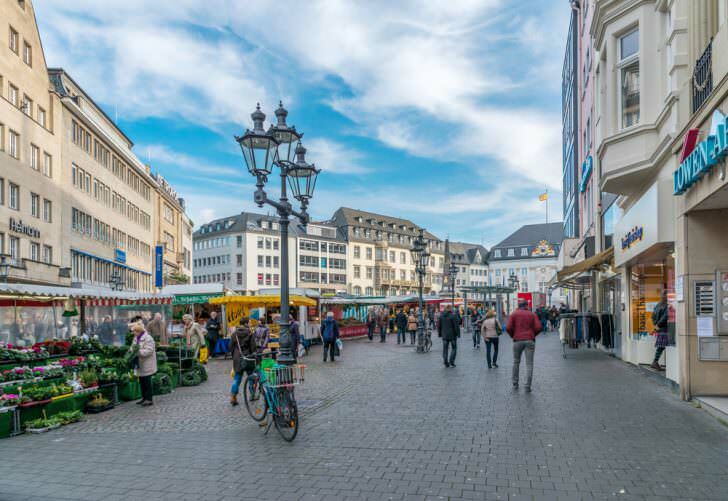 Market Square, Bonn, Germany © Ian Law | Shutterstock, Inc.
Market Square, Bonn, Germany © Matyas Rehak | Shutterstock, Inc. Although Bonn Minster isn’t nearly as grandiose as nearby Cologne Cathedral or other major ecclesiastical sites around the country, the church is actually one of the oldest churches in Germany. It was built during the 11th to 13th centuries in a Romanesque style. Today, it retains the original character that it had (except for the mostly-Baroque furnishings! ), despite the fact that it has suffered considerable damage in the centuries between its construction and now. The nave of the basilica is one of the most architecturally interesting sites: it dates to the 12th century and includes a mixture of Romanesque and Gothic styles. And best of all: visit during the winter and you’ll have the opportunity to wander around a charming Christmas market right in front of the Minster. The Bonn Minster © Shutterstock, Inc. The Bonn Minster © Ian Law | Shutterstock, Inc.
9. Japanischer Garten (Japanese Garden). If you just can’t get enough of those cherry blossoms (or you’re unfortunately there in the wrong season to see them bloom), head to the Japanese Garden as well during your trip to Bonn. The garden was originally designed in the 1970s by the head of the Japanese Landscape Gardeners’ Association, and it’s still flourishing today. Listen to the burbling water cascades, wander around the small, man-made lake, or find your zen in view of the thirteen-tiered pagoda. When I travel, I have a tendency to get tired of the hustle and bustle of always being in cities—Bonn’s Japanese Garden takes you away from all of that and allows you to truly relax for a few hours. Japanese garden in Bonn, Germany © Shutterstock, Inc.
As beautiful and impressive as I find Drachenburg Castle to be, the place doesn’t really invoke those medieval fantasies of what a castle really is—but nearby Godesburg Castle definitely fits the bill for that! It’s not a very large castle, but with its rough stone exterior, it certainly looks the part. It was initially constructed in the 13th century but was mostly destroyed in the late 16th century. Extensive restoration work has restored the castle back to how it originally looked (based on the architectural plans that have survived). However, it’s not the place to run around with sticks pretending to be knights: today it houses a popular restaurant and apartments. The view from the restaurant certainly makes a dramatic backdrop for your meal! Godesburg Castle, Bonn, Germany © Shutterstock, Inc.
Bonn is overlooked by visitors to Germany due to its small size in comparison to Berlin, Munich, and nearby Cologne. But there’s tons to do in this charming little city, from museums to dining! Have you ever visited Bonn? Share your experiences below!